A loaded log truck heading to town. 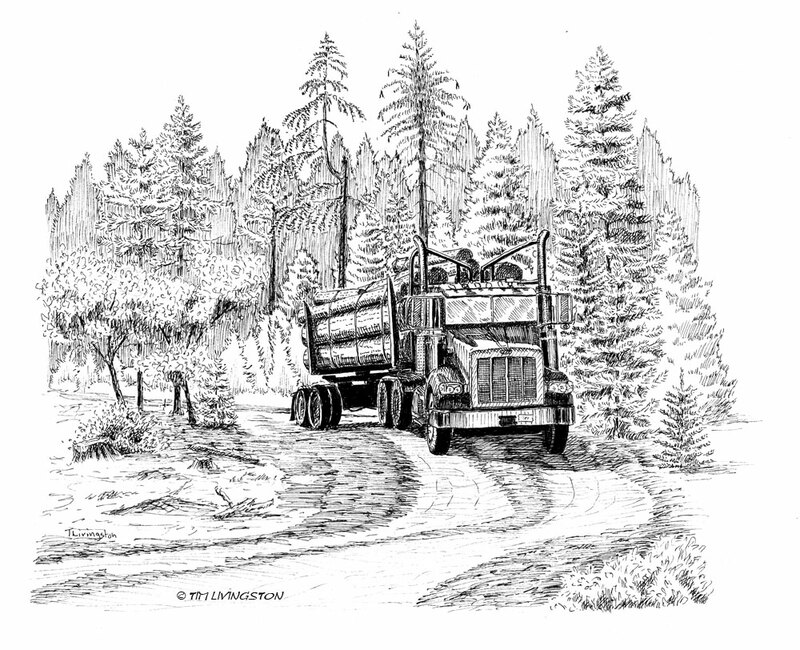 This pen and ink was inspired when I was headed to a logging job near Trinity Lake in Northern California. It appeared in the children’s book Timber In The Working Forest, by Mary A Livingston and illustrated by yours truly. 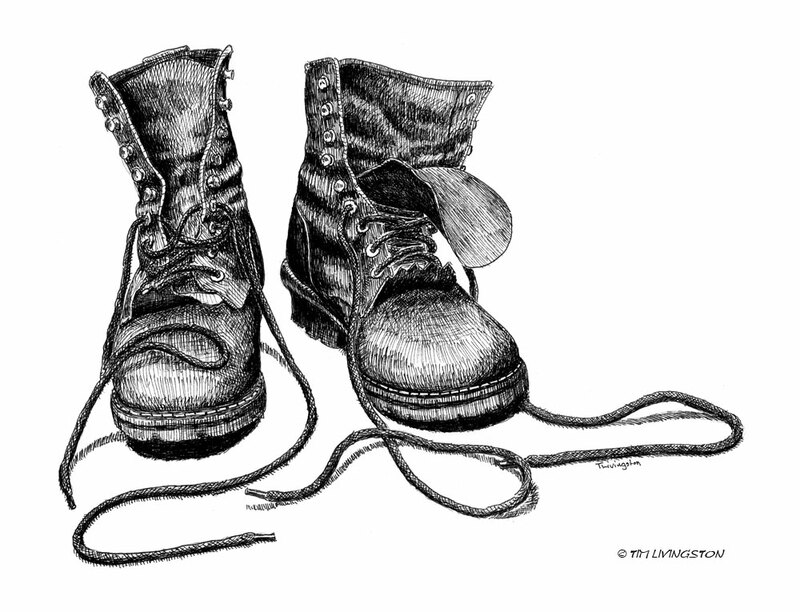 Forester’s Boot, in pen and ink. To be more specific, Forester Artist’s boots! I did this piece for the book Timber In The Working Forest, written by Mary A Livingston. It’s been a quiet week around the osprey nest. They’re hunkered down and sitting on the eggs. It’s a good week to share another one of our locals. I ran into this youngster out behind the log decks. I can never guess what animals I may bump into around the mill. Wildlife will exploit habitat wherever they find it. If you like opossums and you want a great children’s book about an opossum I highly recommend Oh No! Baby-O. Written and illustrated by Mary A Livingston. Forestry Friday … Art Auction Time Again! 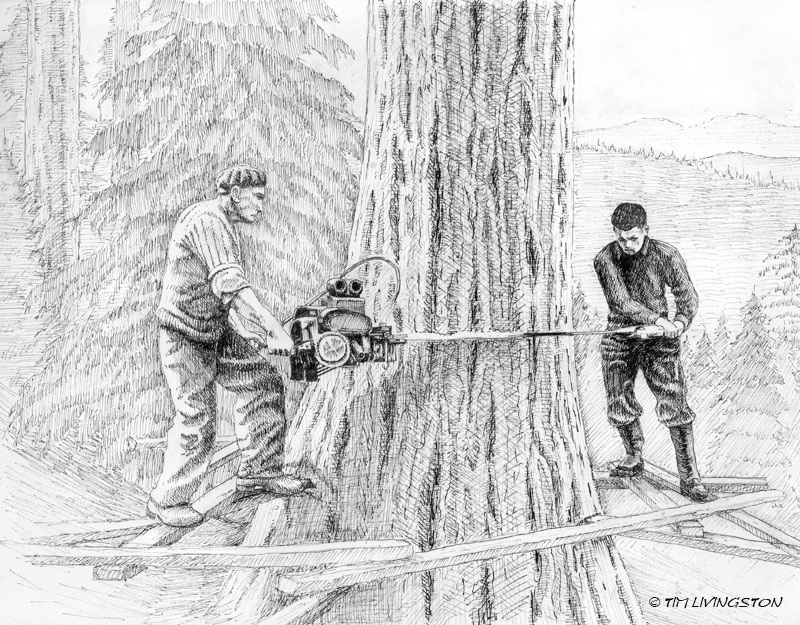 Circa 1940’s, loggers use a two-man chainsaw to fell a large Douglas-fir. Pen and ink. It’s time for Mary and me to create a piece of art for charity once again. Every year we do something for the Sierra Cascade Logging Conference Forestry Education Auction. This pen and ink is my exploratory drawing for my painting. I like the direction it’s going. The tree and the background still needs some tweaking. I was helped out by the Forest History Society. They have an excellent photo library of vintage logging scenes and were kind enough to allow me use it for art reference. Last year at the auction Mary and I each provide a piece of art. To liven things up we competed against each other. It was a big success. You can read about it here on Mary’s blog, And The Winner Is! In fact it was so successful that we are going head to head again this year. We’ll both be working on our paintings this weekend. I can’t wait to see the competition this year. A new painting from Mary. This is our Sailor!